Kyo-ya Management Group selected Hensel Phelps to renovate the lobby of the Royal Hawaiian Beach Club at the historic Royal Hawaiian. The renovations included ADA upgrades, interior landscaping, new stairs, custom upgraded finishes, and a new storefront system. 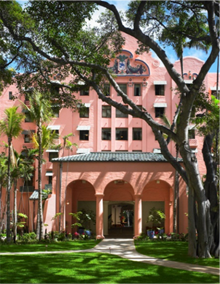 The Royal Hawaiian is part of the Starwood Resorts Luxury Collection of Hotels. Since originally opening in 1927 for Matson Navigation passengers, the iconic Spanish-style “Pink Palace” in Waikiki has entertained numerous celebrities, financiers, and heads of State. The hotel was exclusively leased to the United States Navy during World War II as a recreation center.